I can take not credit whatsoever for this recipe. I was reading David Lebovitz's facebook feed and there it was, a link to the most beautifully indulgent winter-warming concept. The original post is here written by Rebecca & Val at 'Foodie with Family' which is a lovely blog and well worth a look. The post is for hot chocolate blocks with marshmallows, a beautiful idea and the subject of some debate in our house. The b contain condensed milk and plenty of chocolate yet you use them by plunging them into hot milk. Far enough, but since they contain milk, why can't you just put them in hot water? We debated whether my husband would notice us using up the last of his milk in a mug of hot chocolate. The teen hates milk (except in hot chocolate) and I don't use it so it is only my husband who would miss the last of the milk in the fridge. But the snow was falling, the temperatures were sub zero outside and frozen snow & ice was sending cars clumsily ice-skating across roads and pavements. The shops had already been stripped of milk (both fresh and powered) and the length of our conversation proved how guilty we felt about the thought of using the last of 'his' milk on a treat. We spent far longer than is healthy talking about hot chocolate before deciding not to go ahead. Instead we said that would look at the recipe in future to see if we could make the blocks milky enough to dunk straight into hot water with a dash of cream. So, maybe it wasn't the moment to create the hot choc but I was raring to have a go with the marshmallows. I have been collecting marshmallow recipes for a while now, daring myself to have a go, but not quite brave enough! This recipe finally has the weight of the gelatin required, so comforted by the knowledge that weight rather than 'sheets' will give a consistent result, I was ready to go. The original recipe suggests using an 8"x8" tin - don't, it is too small, and the marshmallow will overflow so use a 9" square or equivalent volume. I had to throw a little bit away as I didn't have any more room to pile any more on top in my 8" tin and so my marshmallows were nearly 2 inches high! Sugar syrup is very hot, so pour carefully and remember that the utensils will be hot and sticky too unless you grease them ...do follow the instructions about greasing. The mix is incredibly sticky so greasing the utensils as well is essential to make the whole process manageable. Having made them, I don't think that I quite 'get' marshmallows. I am now faced with 86 pieces of white fluffy sticky air-filled sugariness, possibly the most pointless foodstuff I have ever made. I would like to confirm though, that they are not difficult to make, just sticky, messy and completely superfluous to normal human existence. Line 9 x 9-inch with cling film and lightly oil it using your fingers or non-stick cooking spray. In the bowl of an electric mixer, sprinkle the gelatin over 125ml cold water. Leave to soak for about 10 minutes whilst following the next stages. Combine sugar, glucose syrup and 65ml water in a saucepan. Bring the mixture to the boil quickly, as soon as it is boiling, allow to boil hard for 1 minute. Pour the boiling syrup over the soaked gelatin, attach the whisk and turn the mixer on low. Gradually speed up the mixer until it is running at full speed. Add the salt and beat for between 10 and 12 minutes, or until fluffy and mostly cooled to almost room temperature. After it reaches that stage, add in the extract and beat to incorporate. Grease your hands and a rubber or silicone scraper with neutral oil and transfer marshmallow into the prepared pan. Use your greased hands or the spatula to press the marshmallow into the pan evenly. Take another piece of lightly oiled plastic wrap and press lightly on top of the marshmallow, creating a seal. Let mixture sit for a few hours, or overnight, until cooled and firmly set. Sprinkle a cutting surface very generously with icing sugar. Remove marshmallow from pan and lay on top of the sugar. Dust the top generously with sugar as well. Use a large, sharp knife to cut into squares. Separate pieces and toss to coat all surfaces with the sugar. Now I have always wanted to give marshmallow making a go... despite the fact that I don't really "do" sweets or confectionery and I have no small nephews at hand, I'm going to bookmark this and make it next time we are invaded by a whirling mass of small boys! Thanks for explaining it so well, Kate! If you have 86 pieces of marshmallow hanging around I will send my two children down to you - I promise they will be gone in a flash! I have seen Hugh do it and often been tempted by his recipe in the River Cottage Family Cookbook but always been a bit worried about whether it would work, thank you for convincing me to give it a go. However, I might wait until friends with more children visit, that way my children may avoid turning into something resembling the Marshmallow man on Ghostbusters. I've never made marshmallows as, like you, I never really saw the point of them. A bit like Candy Floss, they seem to be just a vehicle for too much sugar. What a shame you didn't have enough milk for the hot choc. 86 pieces of white fluffy sticky air-filled sugariness...bliss! 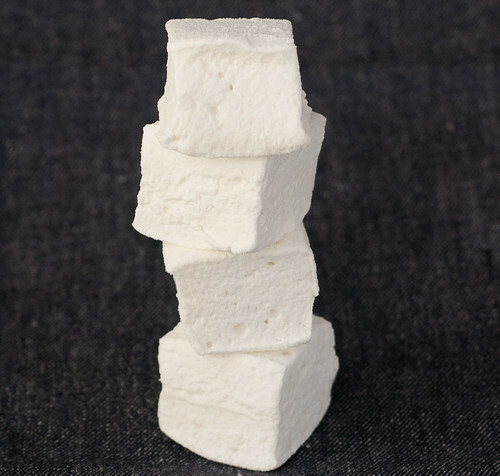 Despite your accusations of the pointlessness of marshmallows I think I'm going to give them a go - have just come across a historical 'dried mallow flower marshmallow' on souschef.co.uk which at least roots them in history and perhaps makes them a little less pointless...? !